Being an Ohio resident since mid-2008 now, I have more or less adopted the hard luck Cleveland Browns as my second football team. So, seeing Draft Day not only accomplished my review mission, but also served as a potential feel good moment to Brownies fans, who have not had a lot of them in the franchise’s history. Draft Day is a fictional sports film detailing the 12-14 hours before and shortly during the NFL Draft, an event where the nation’s top players get selected by some combination of 32 teams in seven rounds over a three day period. Kevin Costner stars as Sonny Weaver Jr., a much beleaguered general manager for the Cleveland Browns. He has been on the job for two seasons, and each has not inspired a lot of confidence in the team’s owner or its fanbase. Even worse, Sonny fired the team’s coach who just so happened to be his father, who has passed away a week or so after the move. He is feeling the heat from his superior to “make a splash.” Luckily, an offer from the Seattle Seahawks gives him that opportunity. By trading his first round pick in three consecutive seasons (including this one), Sonny and his team obtain the rights to the number one selection. This is important, because prognosticators like Todd McShay and Mel Kiper project the pick to be a can’t-miss, franchise changing quarterback in Bo Callahan. Easy decision right? As most general managers would tell you, hitting on a draft pick, even a high one, is never a walk in the park. I love football, especially the NFL. 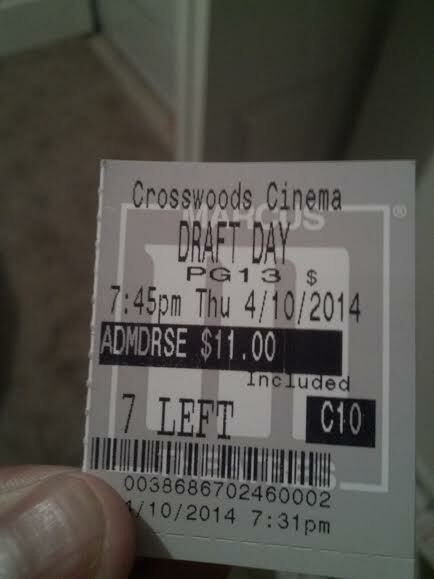 But seeing the television spots for Draft Day did not set my expectations high. Consequently, while this film is nothing special and problematic, it worked enough for me and I was not particularly disappointed. As outlined, the film centers around a draft. Fairly original premise, but like the real thing, it too feels elongated and stretched out at places. It does the best it possibly can to appeal to those uninterested in football and forced to tag along with a significant other by reiterating why so much value is placed on certain things. It even lets the uninitiated viewer know where certain teams are located in a oft-used “Home of the” sequence! Still, those with little or no interest in the sport may struggle to find value or entertainment. On the other hand, while this is a sports film, it does possess enough solid dramatic and occasional comedic elements to stand alone as a drama/dramedy. The role of a general manager has always been an intriguing one. I get a chance to play it out on a fairly small and heavily stripped away scale in Madden, but this movie does a great job of submerging the viewer into the life of a general manager. It is not easy, and one that is filled with stress, personal agendas, and false bravado, especially during draft time. Costner is good here in the GM role, and looks and acts the part. The character is a bit hard to pull for though; at times he seems like a jerk who only wants his way and behaves as if his job title, while a powerful one, makes him impervious to questioning by those on his staff. So, I found myself often connecting with the coach played by Denis Leary. He wants his players and Sonny wants to do things his way, and they naturally clash. Both have valid reasons, but his reasoning came across as more sound. 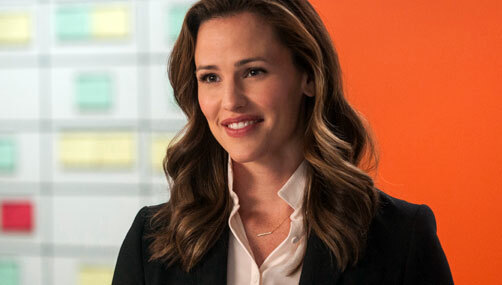 Jennifer Garner is fine here, but she is ultimately present for romantic reasons in the film, which largely comes across as forced. The chemistry on display with Costner is iffy at best. 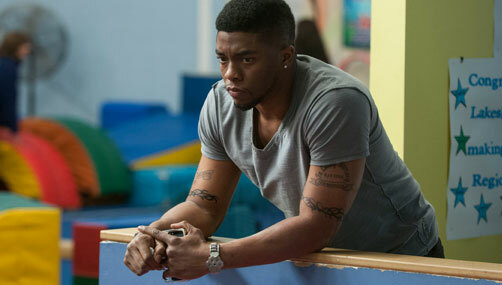 But Chadwick Boseman of 42 fame displays his natural charisma and still untapped talent as Vontae Mack, a linebacker who is vying to be the first overall pick. There are some issues with the plot. The draft is obviously serious business, but it is shocking and a little unbelievable to find out that no one in the organization has tape of the projected first overall pick with eight hours before the draft! I could see if it was months before, but even then, information travels and can be captured so fast in this day and age. There is really no excuse for anyone in the organization to be that clueless on a potential game changer. In addition, the plot is predictable about 20 minutes in with regards to who will be the number 1 pick. As long as the viewer follows the real NFL draft on a somewhat consistent basis, it can become quite clear who the team should take based on issues and flaws certain characters have. Director Ivan Reitman uses an interesting, 24-like technique with this film to inject light tension in certain places. Makes sense, as many of the scenes are phone calls by Sonny either talking to rival general managers, or potential prospects. However, the transitions and framing come across as amateur at times and takes the focus off of the conversation and onto the fact that part of a character’s body is crossing the imaginary split line. This was probably intentional as this was visible many times, but I rack my brain as to why. Nothing from this editing technique added any substance or context. Apart from this, a by the books directing take can be expected, with tons of orange and brown backgrounds. In all honestly, Draft Day could be worse. An quietly impressive cast takes it higher than it probably should be, and the premise will appeal to diehard football fans but may have enough flaws for them to be disappointed. Very interested to see how it does on a national scale outside of Ohio & the Midwest, especially with Captain America 2 likely not slowing down, and the arrivals of a well received Oculus and family fare Rio 2. Regardless of if you know a single thing about football or not, this movie still works. It has a little something for everyone, even if all of those “somethings” don’t always work. Good review Jackson. Thanks for the feedback. I would love to see some data as to how many of the film’s viewers are not football fans and still enjoyed this. I think I may be a little more skeptical than you in that matter. But overall, I was entertained and I could see most who attend will also be. I’ve seen countless bad reviews of this and I think I will listen to them. I do trust yours but the problem is, I am not into watching many sports! So sports movies are sometimes hard to enjoy unless they are extraordinary! May give it a try someday though! I don’t blame you. It is not like a Major League or Rudy or Moneyball film. It will do enough for a fair amount but not blow an audience away. So I definitely say to save your cash if you need a sports film to be extraordinary! Thank you. Based on the trailer, it really could have been terrible.